One of the great Hollywood couples, Humphrey Bogart and Lauren Bacall starred together for the second time in 1946’s The Big Sleep. 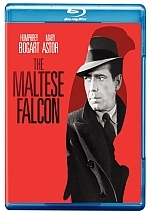 Based on the Raymond Chandler novel, we meet Philip Marlowe (Bogart), a Los Angeles private detective. Retired General Sternwood (Charles Waldron) hires Marlowe to deal with blackmail related to his loose cannon daughter Carmen’s (Martha Vickers) debts. This sends Marlowe to tail AG Geiger (Theodore von Eltz), the proprietor of a rare books store who may not be what he seems. As he stakes out a remote house that Geiger entered, Marlowe hears a scream and gunshots. When he rushes into the abode, Marlowe finds a disheveled, drugged Carmen – and a murdered Geiger. This leads Marlowe into a complex, seedy world, one that eventually pushes toward romance with Carmen’s edgy sister Vivian (Bacall). For my money, 1941’s Maltese Falcon stands as the best movie of its genre, so any film noir with Bogart faces high expectations. While not quite as good as the sublime Falcon, Sleep manages to deliver a pretty strong detective tale as well. Really, I’d feel hard-pressed to find any areas in which Sleep falters. My preference for Falcon is just that: my own personal inclination. I simply like the basic story of Falcon more, so it gets the edge. But it’s a close call, as both films offer pretty similar strengths and few weaknesses. I guess I’d argue Falcon offers the better cast, as I don’t think Sleep boasts supporting actors as delightful as Peter Lorre or Sydney Greenstreet. However, Sleep comes with the superior female lead. Mary Astor was Falcon’s weakest link, as she appeared somewhat drab, and it never made sense that Bogart’s Sam Spade fell for her. Such concerns don’t arise in Sleep. Bogart and Bacall show excellent chemistry, and unlike the lackluster Astor, Bacall more than holds her own against Bogart. The pair light up their scenes and give us a good connection at the heart of the film. Though I find Spade to be the more interesting character, I like Marlowe’s versatility. He comes across more of a chameleon, and this allows Bogart to expand his repertoire. In particular, we get a fun scene in which Marlowe adopts a disguise at Geiger’s store. Bogart embraces all aspects of the part of brings out the character’s personality. Sleep also boasts a complex, intriguing story that unfolds in an involving manner. The screenplay comes with an astonishing pedigree, as it boasts an actual Nobel Prize winner! Though best known for his novels, William Faulkner worked on a few films, and Sleep remains the most noteworthy of the bunch. Along with co-writers Leigh Brackett and Jules Furthman, Faulkner created a vivid script. The movie progresses in a dynamic manner that allows it to invest in various situations in a lively way that avoids lulls. The screenwriters manage to bring the tale to life. Of course, director Howard Hawks adds to the project as well. He ensures that the film comes across with both style and substance, and he displays all aspects of the production in a positive light. Ultimately, The Big Sleep offers a pretty terrific detective story. It fires on all cylinders and earns its status as a classic. 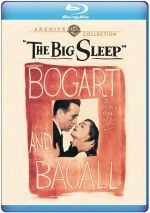 The Big Sleep appears in an aspect ratio of approximately 1.37:1 on this Blu-ray Disc. The transfer defied its age and looked very good. Sharpness appeared nicely tight and distinctive most of the time. A smidgen of softness occurred, though I suspect these instances came from the source photography. I didn’t think those concerns because problematic, though, as the definition was fine most of the time. No issues with shimmering or jagged edges occurred. Despite the film’s advanced age, source flaws were non-existent; this was a clean presentation. A good layer of grain appeared, so I didn’t suspect significant noise reduction. Contrast was strong, as the movie consistently maintained a nice silver tone. Blacks were deep and firm, while shadows were smooth and well-defined. Overall, this was a strong presentation. While not in the same league as the picture, the DTS-HD MA monaural soundtrack of The Big Sleep also worked well. Speech seemed reasonably accurate and distinct, with no issues related to intelligibility or edginess. Music came across as fairly bright and lively, though dynamic range seemed limited given the restrictions of the source. Effects were similarly modest but they showed good clarity and accuracy within the confines of 70-year-old stems. This was a more than adequate auditory presentation for an older movie. In addition to the film’s trailer, we find a 1945 Alternate Version of The Big Sleep. A one-minute, 14-second intro from the UCLA Film and Television Archive’s Robert Gitt tells us a little about the pre-release cut, and “1945/1946 Comparisons” (35:59) digs into the differences. As for the alternate version itself, it runs one hour, 56 minutes, and 18 seconds, a little longer than the theatrical cut’s 1:53:55. Though the pair fill almost the same amount of time, they come with a slew of alterations that make them moderately different in the end. Both cuts work well and it’s nice to get the choice. Though I strongly suspect most viewers will select the 1946 version simply because it offers a much superior presentation. A standard-def transfer, the 1945 version looks okay, but it lacks the clarity and precision of the 1946 edition. The first edition also comes with a slew of print flaws. While watchable, the 1945 Sleep looks much less attractive. While “Comparisons” program concentrates on the differences between the 1945 and 1946 versions, Gitt manages to dig into other subjects as well to flesh out our understanding of the production. “Comparisons” offers insights about studio politics and behind the scenes wrangling in addition to its examination of specific changes. This becomes a valuable way to scrutinize the two versions. One can quibble about where The Big Sleep stands among Humphrey Bogart’s films, but I think it needs to be top five at worst. It provides a delightful, involving detective tale that fares well in all ways. The Blu-ray brings us good visuals and audio along with an alternate version of the picture. Fans of classic movies will feel very pleased with this solid release.